Three Amazon Echo Dots For Only $69.97! That’s $23.32 Each! PLUS FREE Shipping! You are here: Home / Great Deals / Amazon Deals / Three Amazon Echo Dots For Only $69.97! That’s $23.32 Each! PLUS FREE Shipping! For a limited time, head over to Amazon and get an Echo Dot 3rd Generation for only $49.99 PLUS FREE shipping! 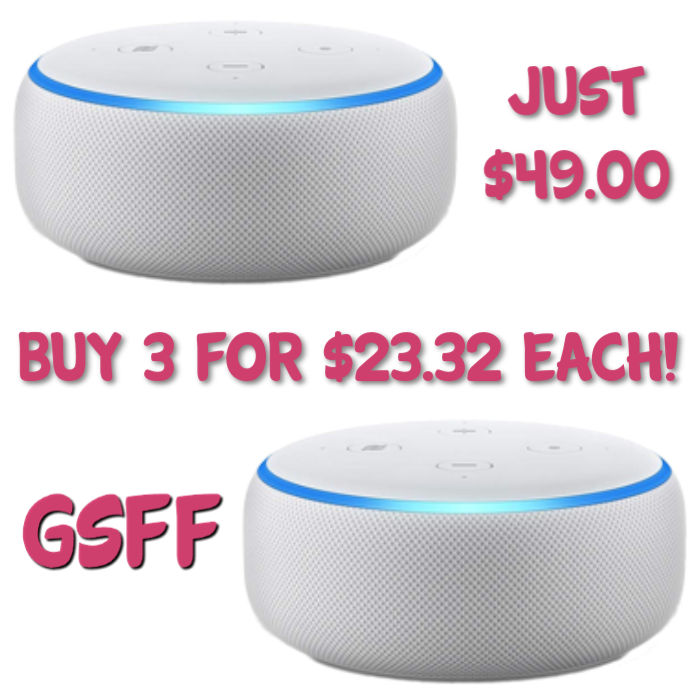 Made even better, when you add THREE of these Echo Dots to your cart, you will get an automatic $80 discount, making your total for just $69.97 — that’s $23.32 each! The Echo Dot is a hands-free, voice-controlled device that uses Alexa to play music, to check the weather, to get updates on sports score, to listen to audio books, to control your smart home devices, and more! It also features “skills” that allows you to do a lot of things: From ordering pizza, setting alarms to streaming songs!